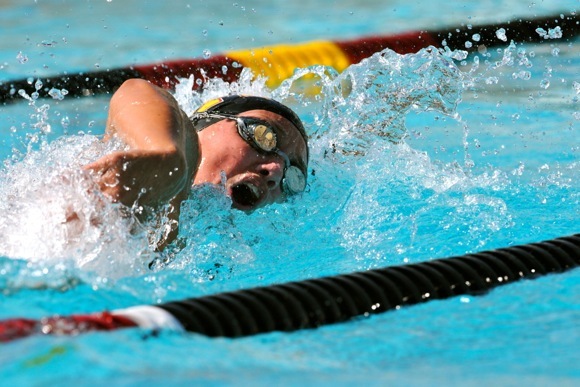 Menlo-Atherton High School swimmer Brooke Stenstrom, a sophomore in the Fall, has perhaps the brightest future of any swimmer currently at M-A. She competed for M-A at the CCS finals, capturing second place in the 50 meters freestyle. For that swim, Brooke was delegated all-American status, which places her in the upper echelons of swimmers in the United States. She is the daughter of former 49ers quarterback Steve Stenstrom and international competitive swimmer Lori Heisick-Stenstrom, who have helped mold Brooke into the athlete she is today. This year Heisick-Stenstrom took over as the swim coach at M-A, so served as her daughter’s head coach. Here, Brooke talks about her experiences with swimming, having professional athletes as parents, and her goals for the next three years. InMenlo: What got you into swimming? Brooke: When I was 7 or 8 my parents, especially my mom, wanted me to start swimming competitively so I did. But I knew how to swim a long time before that. InMenlo: What has been your proudest swimming moment? Brooke: I’ve had a couple recently. At Junior Nationals, the girls team got second over all and getting to go up on the podium and accept the trophy was really cool. Also recently I won my first Far Westerns, which is something I’ve wanted to do for a really long time, so it was fun to finally do it. InMenlo: What’s it been like having parents who were both competitive athletes? Brooke: It’s really an honor to have my parents be athletes. I’ve learned a lot about how to win and how to lose graciously — and how to always do your best and give it all you’ve got. InMenlo: Do you guys do athletic stuff as a family? Brooke: My dad used to take us to this hill on the weekends and make us run up and down it, and do dry land training stuff. But now, we all work out so much because of club and stuff, and my siblings all play sports, too. So when we do spend time as a family we just like to relax and hang out. InMenlo: What have you especially liked about M-A swimming? Brooke: I like all of the different grade levels coming together. It’s not just the freshman and the sophomores and the juniors and the seniors by themselves, it’s everyone together so you get to meet a lot more people. And everyone is just really supportive of each other, because we are competing as a team. InMenlo: What is it like having your mom as your coach? Brooke: People think that it might be weird, but she’s been coaching me for a while, so there’s nothing really weird about it. So it’s been fun. I get a lot of “oh your the coach’s daughter” but other than that it feels really natural. InMenlo: What have you learned the most from swimming? Brooke: I have learned never to take the easy way, and the harder way usually gets you where you need to go. Perserverance too, keeping your head up. InMenlo: What is your funniest swimming memory? Brooke: At Far Westerns, we were about to swim the relays, and there was this duck on the deck and it flew and landed in the middle of one of the lanes. It was hilarious, it held up the meet for like 10 minutes and finally somebody scared it away. InMenlo: Who inspires you the most? Brooke: I know it’s really cheesy, but [Olympic swimmer] Missy Franklin. She’s just such a fantastic swimmer, and she is so humble and such a great person. If I were to become a professional swimmer, I would want people to look at me like that. Writer and photographer Annalise Deal will be a senior at Menlo-Atherton High School. She wrote this article for the M-A Bear News, where it originally appeared. Used with permission.